Yesterday night Syntagma Square was once more flooded with protesters but with a difference: last night was a singing protest! 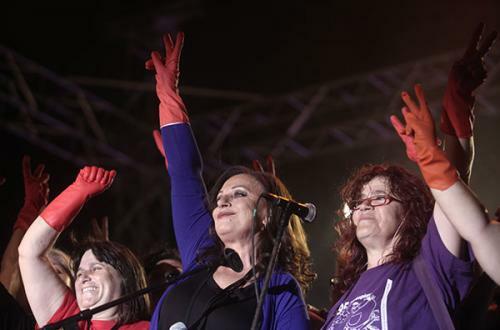 Haris Alexiou, one of the most popular and respected singers in Greece gave an open air concert in support of the cleaners’ struggle*. Wearing cleaning gloves she waved her hands in return to the audience clapping and singing along. The Concert was organised and supported by the radio station “Sto kokkino” – it means “on red” , a left-wing radio. Haris sang old and new ballads and managed to refresh our souls despite the heat! *The cleaners’struggle has received great publicity and attracted much sympathy worldwide because in their case the injustice is blatant. They were found “redundant” and fired. They took the government to court and were justified but the government has appealed the court decision and they are still out of a job. They belonged to the Economics Ministry employees – all 600 of them. The Ministry has had to replace them with private cleaning agencies which cost them as much as the full time cleaners. The cleaning ladies have been camping outside the Finances Ministry for the last two months. 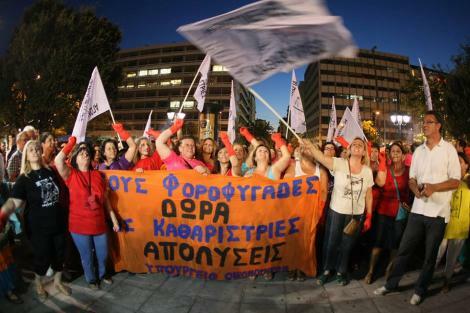 They have become a focal point for many other public sector employees who have been summarily fired in order to satisfy the Troika demand for a smaller public sector. My pc decided to take its annual vacation during August this year, together with every e-shop in my area. I ended up answering my e-mails from a billiard room, smoky, noisy, conducive to nothing more intelligent or intelligible than hellos and jokes and posting nothing! But September is here, the month of duties, of income tax returns, of school opening, of my birthday. a. Heat – the month has started with higher temperatures than August and the humidity rocketing. b. The only people with a good income this month are the bookkeepers and tax specialists. This is the first time that everyone submits his income tax return electronically. Every child and grandchild has been commissioned to help the elderly but they are not enough. Rules and regulations change daily, the tax offices are not sufficiently manned, mistakes are a daily occurrence and a long cues to correct them have become an everyday event! c. Schools opened yesterday, September 11 (NOT the best of dates as omens go…). The students were given books but found fewer teachers than last year. d. Tsohatzopoulos’trial continues to claim air time but people are largely uninterested. e. Athenians spend the best time of the week looking for friends or acquaintances with a summer house who can accommodate them for the week end.. But the best part of September is that all performers who were touring Greece during the summer are now back in Athens. 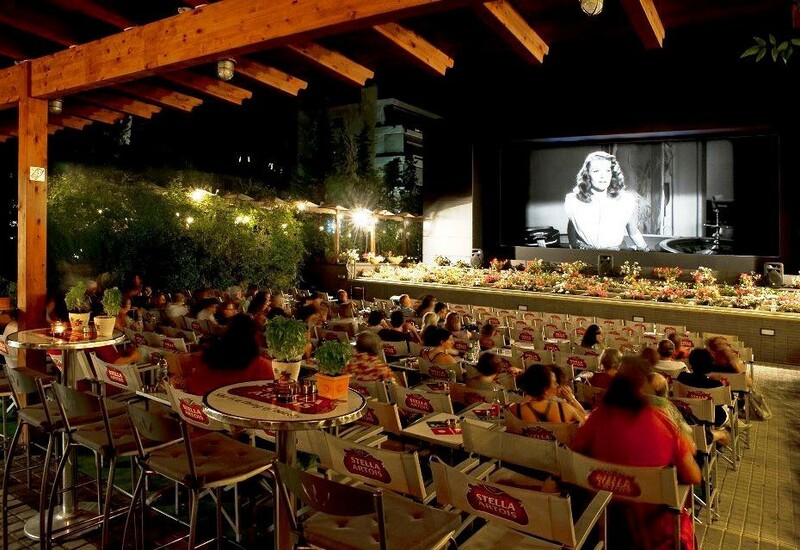 Concerts and plays, film festivals and art performances are at their peak and at low prices. I wish you all a good autumn/fall! Greek summer, in all its scalding glory, is here to stay with us for a couple of months. It becomes easier to travel from one end of Athens to the other within minutes. Bus services are slower but there are less cars. Greek citizens are looking for escape and thank god they have quite a few choices: there are some free of charge easily accessible to the 4 million metropolis public beaches, there are friends summer houses, there are home villages on mountains and islands brimming over with visitors, there are hotels faced with bankruptcy which have, finally, decided to make very cheap offers to the Greek tourist and are being resuscitated. I happen to be one of the few staying behind – by choice – so let me take you around my city in the summer. First of all if you decide to visit Athens this is the best time of the year provided you stay in a southern suburb, by the Saronic Gulf. I suggest Palaio Faliro but depending on your budget you can go further out. Glyfada, Vouliagmeni, Varkiza all have excellent hotels but their prices are steeper all over: accommodation and food wise. Transport is cheap (1.20 Euros for a one way tram/bus trip and if you buy the 1.40 ticket you have 90 minutes travel on any transport. I prefer the tram because being the newest addition of the mass transport system of Athens it is clean and properly conditioned. It is not very fast or frequent but then it is the holiday season, who cares? By catching the tram you are at the new Acropolis Museum within minutes, you can take a stroll under the Acropolis at the pedestrian area around it and reach the Plaka region on foot. The railway leaves from Thission and you can connect to the tram at the Peace and Friendship Stadium – at the Piraeus entrance – to get back to your hotel or continue towards the (usually expensive) fish taverns of Pasalimani or the delightfully cheap ones of Kallithea. 1. Taxi drivers are much more polite and helpful. Check the meter though.. 3.20 is the minimum fare to anywhere. 2. Restaurant owners are returning to more traditional dishes thus adding value and novelty to your eating out… Ask for a receipt..
3. Coffee breaks are much cheaper provided you keep in mind to avoid the fashionable haunts which still charge about 4.50 for a fredo capucino but much less for a nescafe frappe which I think you should try. 4. Many special offers from good hotels. 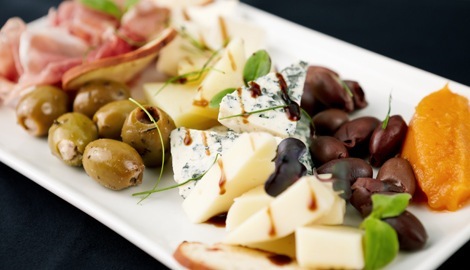 Dekapentavgoustos, the 15th of August, is a public holiday in Greece. The cities empty and the countryside comes alive. Athens looks like a ghost town today. Whoever has not left on holiday is on one of the nearby beaches. Ellinikon Municipality Beach is one of the few organised beaches which do not charge an entry fee. Right next to the old Athens airport the Beach is operated by the Municipality since 2005. Until then the whole area was given to private entrepreneurs who charged not only for the use of their facilities but also for the simple access to the sea. Mayor Kortzides claimed the use of the beach for the Ellinikon citizens but also for whoever wanted to use it. Together with his citizens he started a long struggle against powerful interests. Finally, and after a 24 day hunger strike, the Mayor won and the beach is now open to the public. We visited the beach today. There are many umbrellas and chairs provided by the Municipality, there is space for the people who bring their own umpbrellas with them, changing rooms are available, the showers do not operate on holidays and weekends because the private water supplier charges exorbitant prices. During the week the Municipality provides water for the showers by its own vehicles. There is one coffee shop with reasonable prices – two souvlakis,chips and bread cost 4 Euros. 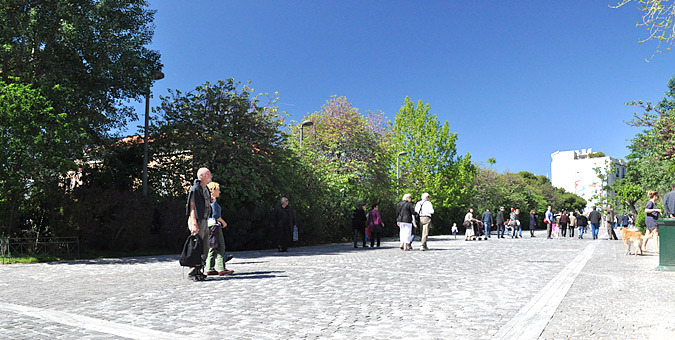 The site is also served by the tram and many bus services thus making it acceccible to people without a car. While we were sipping our coffee a very disturbing announcement was made through the loudspeaker: this beach, one of the very few ones affordable to all, is in danger. The government is thinking of “selling” it!! Another privatisation that deprives Greeks of their patrimony and, if built, will definitely harm the environment too. Greece has had a busy agenda this year: we had elections – twice, we have had two different governments and going for the third, right before the elections fires ate up part of the Attica forests, pharmacists refuse to provide medicine for the social security patients claiming that they have not been paid for months, the new Prime Minister goes to hospital together with the new Financial Minister, pensioners do not know how much pension they are going to get! How can one react to such a situation? Pretend to be Zorbas and start dancing or, with temperatures around and over 35 degrees, hit the seaside. This is in accordance with Melina Merkouri’s interpretation of Medea: no tragedy, no killing of children, a happy family which, after the father’s minor lapse, get together again and head to the seaside. How can a woman, even a barbarian, kill her children? With these thoughts in mind I have started looking for the perfect island for this year. 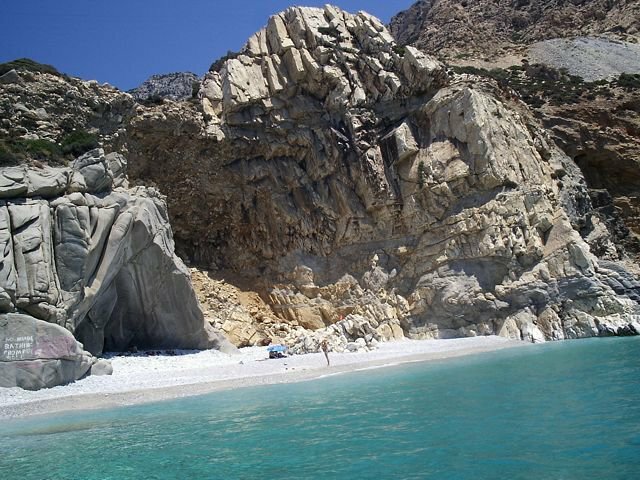 Ikaria, Nikaria according to the locals, is very popular with the Greeks but not so much with foreign tourists. 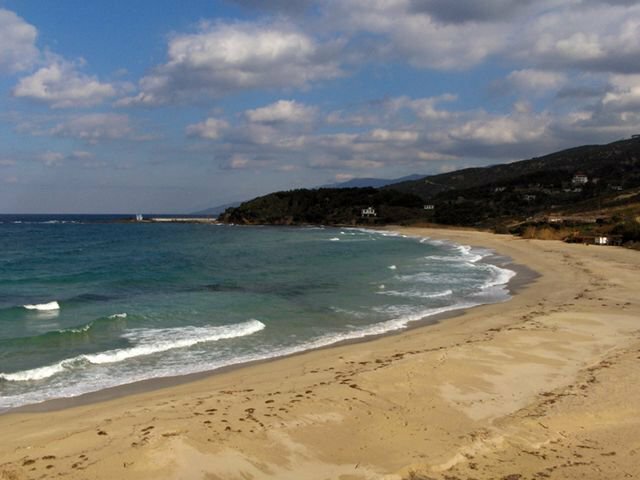 According to friends coming from the island Ikaria is a well-kept secret. I was invited to the 100 year anniversary of the Ikarian revolution, a revolution whose existence I ignored but it says something for this tiny island’s inhabitants. During the 1912 Turkish – Italian war the Ikariotes took advantage of the conflict and rebelled against the Turkish guard (a very small guard to be honest) and declared the island an independent state with its own national anthem and flag. They were incorporated to the Greek state five or six months later but they still threaten with independence when ignored by the central government and always vote left. “The red island” among its friends, Ikaria boasts archaeological sites, lovely beaches, geological wonders, villages that wake up and start work after 10 o’clock at night (!) and endless fairs: Saint this and saint that are reason enough to have a celebration that includes eating, drinking the famous Ikarian wine and a lot of dancing. Ikariotikos is a very popular island dance performed on every occasion and often without any occasion. Maganitis: village and beach with interesting geological phenomena. Reminded me of Meteora. Well, Ikaria is not an easy destination but definitely a different, interesting, vibrant, colourful small island. According to Greek daily Kathimerini the fires raging in the North East of Greece, in the Thrace area and very close to the Greek Turkish borders, have destroyed more than 15 thousand acres of wooded and agricultural land. About 10% of the nature reserve of the Dadia forest have been burnt while there is no danger for villages at the moment. prefecture of Arcadia, in central Peloponese, is also on fire. The particular area is far from the sea and had so far been secure from land mongers. 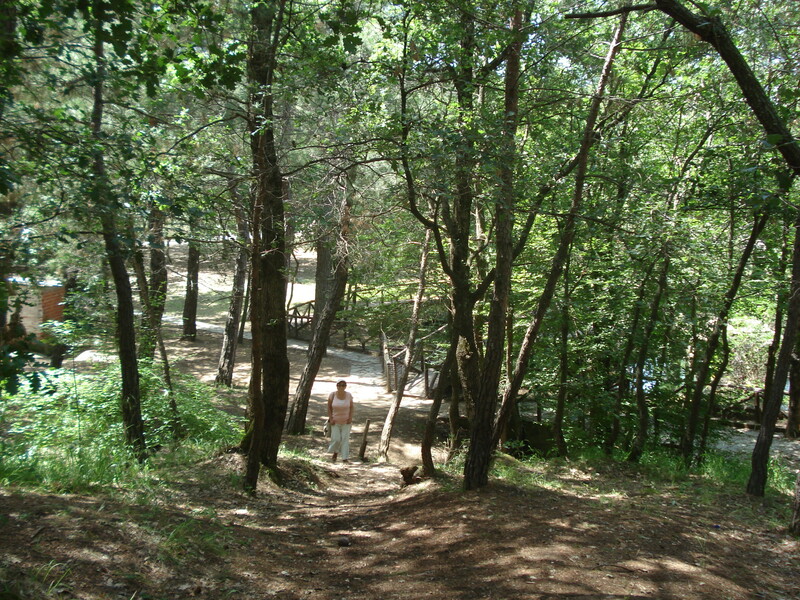 Its forests and scenery were almost magical and unique in the south of Greece. Unfortunately, as I have seen with my own eyes, there is no environmental policy or awareness in Greece. In the most beautiful gorges you see dumping sites. The weeds that grow in the winter are not cleaned up so when they dry in the summer they are the best food for forest fires. The communities in the surrounding areas are not equipped with any fire fighting mechanisms (fire engines, hydrants, volunteer fire fighters, etc). The Greek governments, present and previous ones, have never bothered to educate the people on fire fighting techniques and prevention. The authorities should know by now that August is the most dangerous time of the year and help minimize the climate risks. Instead they legalize buildings that have been built in non-residential areas with understandable results! !